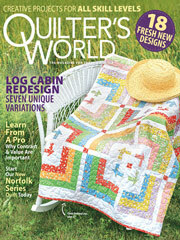 Scrap strips combine to make this quick and easy Log Cabin bed-size quilt. Finished Quilt Size: 87" x 87". Block Size: 10 7/8" x 10 7/8".